When not lazing on one its world-famous beaches, the island of La Digue has some great dive spots waiting to be explored. Breath-taking granitic slopes and underwater rock formations, along with an abundance of colourful fish species, make diving in La Digue a must for anyone visiting the island. 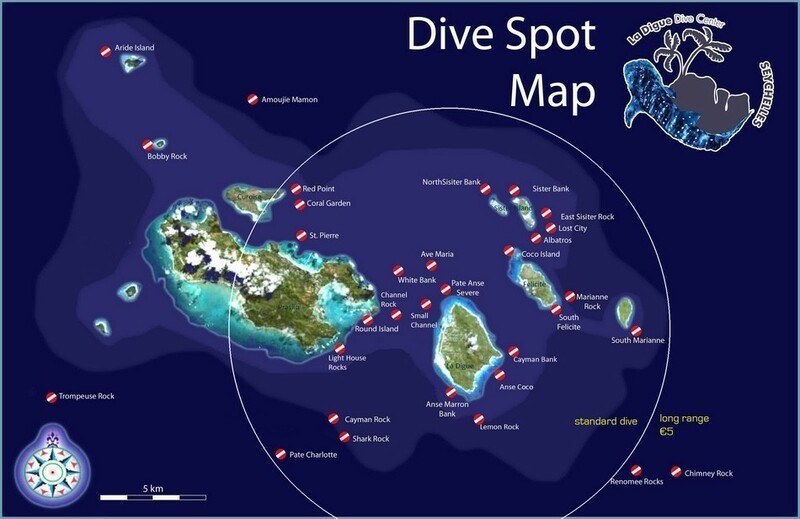 With up to 19 short to mid-range dive sites to choose from (see map below) there’s plenty to see, from colourful Angelfish, Parrotfish and octopus to Whitetip sharks, Eagle rays and Hawksbill turtles. We’ve teamed up with Azzurra Pro Dive - based right in the heart of La Digue at Anse Reunion - whose friendly team will make sure you get the most out of your La Digue diving experience. For those wishing to discover the aquatic realm of La Digue and its neighbouring islands, Azzurra Pro Dive is the place to go! 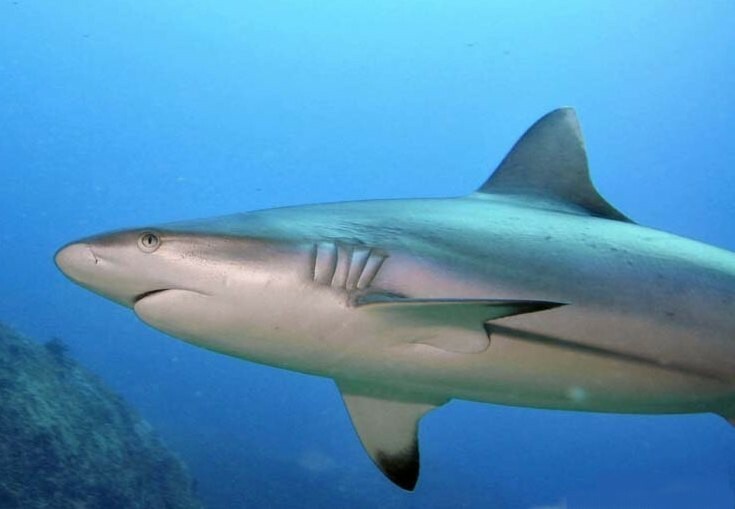 Our selected La Digue diving partner is a PADI certified dive centre with professional, friendly staff and is located next to the La Digue Island Lodge - right in the heart of La Digue at Anse Reunion. Although the smallest of the three main granitic Inner Islands, La Digue enjoys year-round comfortable weather and crystal-clear waters, making it the ideal destination to enjoy some spectacular diving. You can check availability here for your fast ferry to La Digue from either Mahe or Praslin. Azzurra Pro Dive offers daily dive excursions, snorkelling trips and a range of diving courses from the complete beginner up to professional certification. Whether you’re a certified diver looking to do some fun dives, or have no experience and are looking to take your first breaths underwater, Azzurra Pro Dive is waiting to welcome you. Their experienced team will guide you safely through La Digue’s magnificent underwater environment: enjoy floating weightlessly over amazing granite slopes and rock formations; experience the thrill of diving amongst schools of colourful fish and reef sharks; and discover the natural underwater beauty of La Digue and its flourishing marine life. Never dived before or want to further your diving skills? Azzurra Pro Dive is proud to offer a range of courses from the international diving organisation PADI - the world’s largest and most reputable diving association. For the complete novice, an Introductory Dive is a great way to experience the thrill of being in an underwater environment. Those looking for more than just a ‘one-off’ encounter can sign-up for the Open Water Course, after which you’ll be licenced to dive anywhere in the world! Certified divers, looking to develop their diving knowledge or skills, should take advantage of the excellent tropical conditions and get involved in one of the many exciting specialty courses on offer, which include: Underwater Photography; Navigation; and Night Diving. The experienced multi-lingual instructors at Azzurra Pro Dive can teach in English, French, German and Italian and offer courses in a relaxed environment at a pace to suit you. The dive centre is right on the beach at Anse Reunion and is within walking distance of the majority of guesthouses; although nothing is ever that far away if you’ve rented a bicycle. They’re open every day from 8h00 to 17h00. Morning excursions leave the dive centre at 9h30 and go out for 2 dives, retuning at around 13h30. The afternoon dive leaves at 14h30 and come back at 16h00. All dives are from the Azzurra Pro Dive SeaCat 3, an 8 metre catamaran-style diving boat equipped with radio, lifejackets, GPS navigation and emergency oxygen. The boat can carry up to 12 passengers and crew and groups are kept to a maximum of 6 divers per guide. 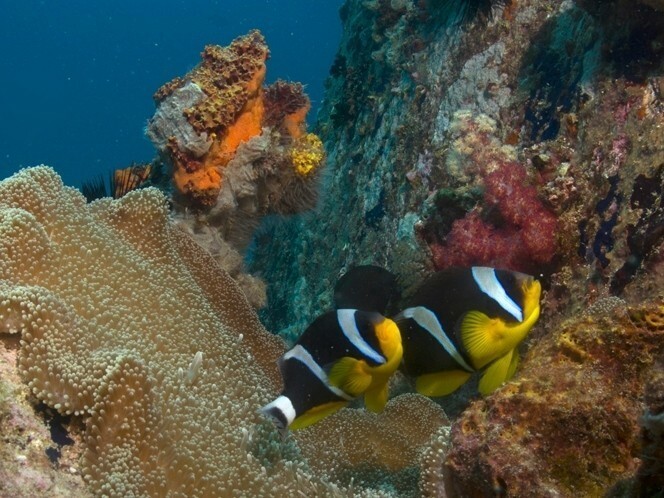 Exclusive to Seychellesbookings.com, Azzurra Pro Dive are offering some great savings on fun dives. Check here for their latest special offers. Guests staying at the La Digue Island Lodge can benefit from even greater savings! See below for an overview of the many dive sites waiting to be explored!